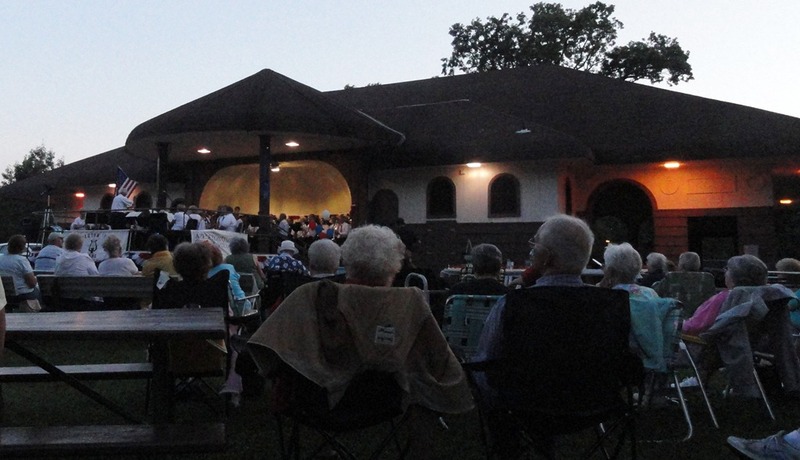 Appleton ended its summer series of music in Pierce Park last night with perfect weather, blue skies, and a gentle breeze. I found my way to the south side of town where cars already lined the streets around the park. A few people came in senior buses, some walked and others rode on bikes. 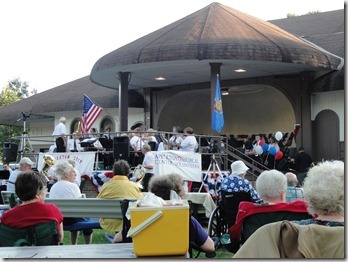 Children were enjoying themselves on the playground equipment and the adults were gathering in their folding chairs around the bandstand under the great trees. Schwan’s had a curbside ice cream offering and many concert goers were finishing up picnic fare they had toted along earlier. Instruments tuning, sound checks, and friends greeting each other filled the air. I thought this would be one of the best concerts of the summer due to the director’s retirement and because it was the last concert of the season, I was not disappointed. I found a place fairly close, with few distractions and settled in for the performance. As I waited I thought about how summer music in the park has been a tradition in my family for many decades. 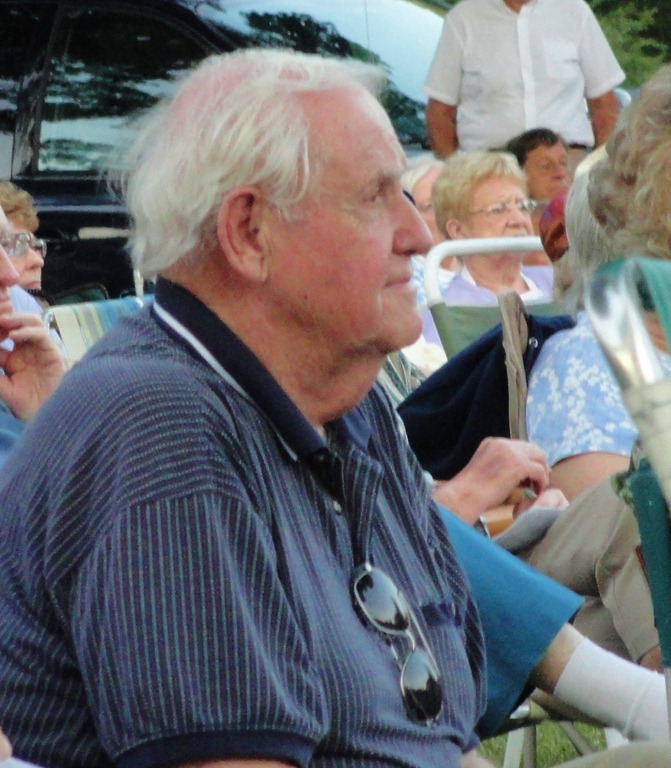 My Aunt Harriet shared with me recently that my Grandpa Stone loved to attend summer concerts in the Beulah Park across from the former Northway Inn on the shores of Crystal Lake. 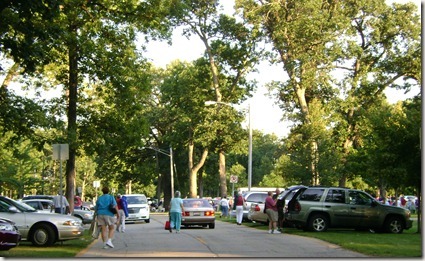 The park had a band stand in the center which hosted concerts for the locals and summer visitors, alike. My Grandpa would get down to the park early and acquire a seat on a bench where he could visit with all who passed by before the music began. 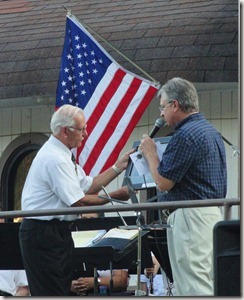 My husband retired from his long high school band directing career to directing the local community band that he helped start up. 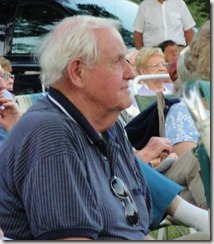 I often attended several of his concerts each summer in the various community parks throughout Benzie County. I even played one year. Emotion welled up in my eyes, as I again, sat in my folding chair and readied myself for listening to another summer concert under now, a Wisconsin evening sky. Presentations were made to Ike Spangenberg,the director before the start of the evening. He was presented with an original score from Irving Berlin’s “The Song Has Ended, But the Melody Lingers On”. The mayor, Tim Hanna presented Mr. Spangenberg with a plaque for his 45 years of service to the city and the paperwork which officially proclaimed Tuesday as “ Ivan “Ike” Spangenberg Day”, a very nice tribute. 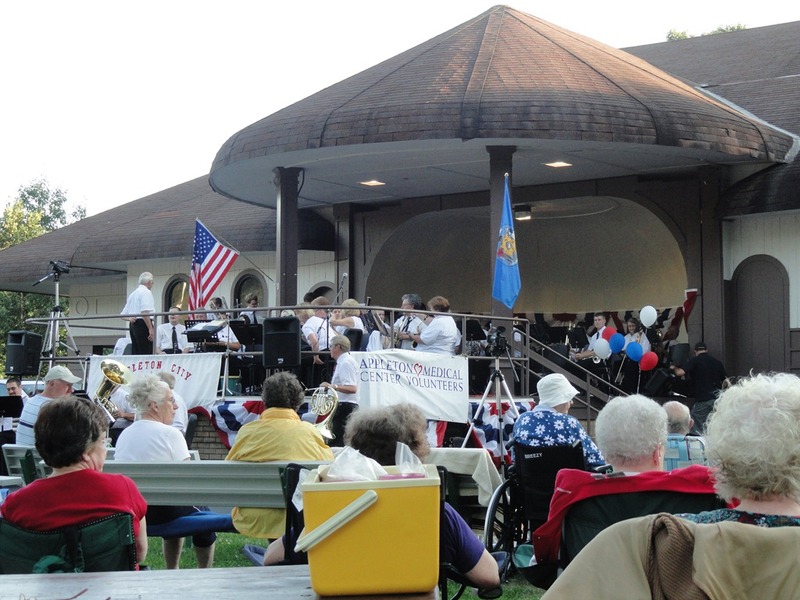 Then the concert began with an opening warm up tune that sounded vaguely familiar as a beer commercial jingle, which would not be so surprising since this IS Wisconsin, then on with the marches, classic band pieces, folk and show tunes, even nostalgic war medleys. The war tunes were especially big crowd pleasers, ending with rousing applause and cheers from the many seniors in the audience. 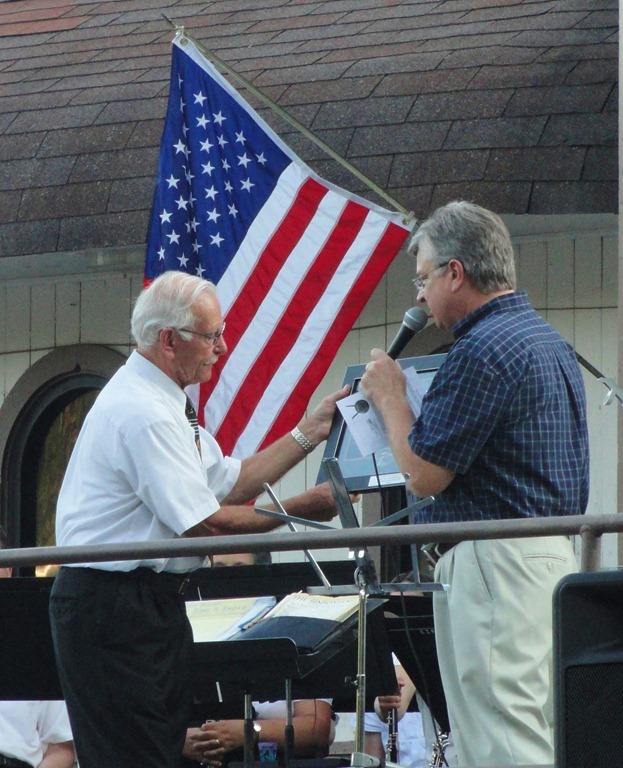 A local arranger from Waupaca, Jack Whitney, was in the crowd and honored with a Dixieland piece that he had arranged, that had many a toe tapping. 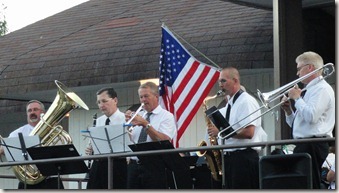 The evening featured full band as well as ensembles and soloists. The audience was invited to come down front to dance if they were so moved, but only two little sister took up the offer and twirled and moved to the music, unaware of the crowd behind them. 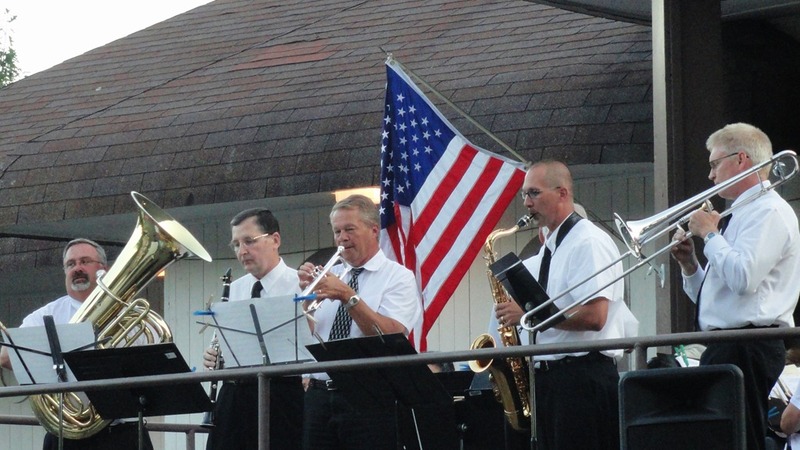 As twilight descended on last evening’s crowd and the vast park, the band ended with the popular “Stars and Stripes Forever” with the expected encore, that,of course, had everyone clapping and smiling. There was more to smile about: cake for hundreds was cut, plated, and ready after the finale. As I ate my cake I reflected on how quickly summer was coming to an end. A sad thing but many new memories to ponder.